Before any sales or customer relationships can be made, SaaS companies have to begin by attracting the attention of potential users. Traditionally, content marketing efforts include blogs, eBooks and webinars, but the type of content used to establish that initial connection continues to evolve. 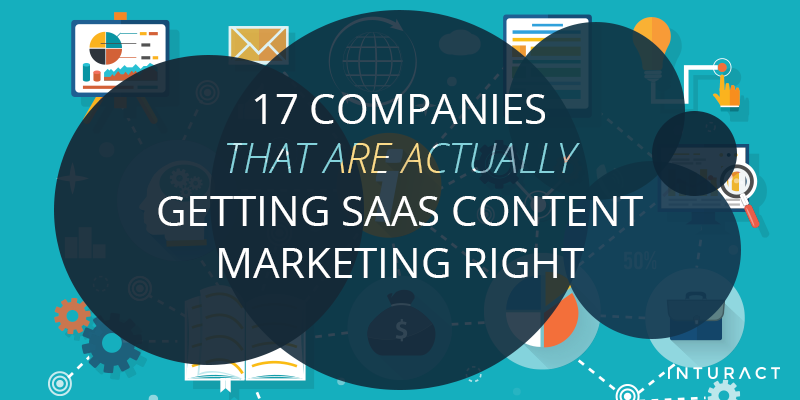 These companies have become leaders for their ability to generate content. The success of this company’s search engine optimization (SEO) software is perpetuated by consistent content creation that leverages its growing community. Thus far, more than 500,000 customers have helped Moz become an essential destination for users within the online marketing space, and the company’s content marketing campaigns stand out as some of the most well-executed out there. Through SEO and simply a mastery of its subject matter, HubSpot has become a site virtually unmatched in how well it understands its audience. More than just a platform for its SaaS product, the company has become a reliable resource for users and non-users alike and, at this point, is synonymous with inbound marketing. Optimization is key to business success in today’s world, and Buffer gives users the chance to schedule their social media content with ease. The company itself reaches out to new prospects with its popular blog, which has expanded its scope over the years. As a result, it has quickly risen to become a major player in its niche. Once prospects have been attracted to your product, the next logical step on the SaaS Marketing Journey is to convert them into users. Ultimately, the goal is for your target audience to consider making an investment in your product. So it’s important to delve deeper into the details of why your product is worthwhile and really showcase where your business excels. Proclaiming itself the “world’s fastest and most customizable landing page builder,” this company employs a rich blog centered on conversions as well as webinars, content guides and other free content, including a separate blog that gives visitors a glimpse behind the company’s operation. With a business centering on analytics software, KissMetrics has become a reliable source of information due to its variety of blog topics, infographics and a learning center that helps users understand how their products works, leading them naturally towards conversion. Once users have engaged in your product, the time has come to remove any roadblocks in the decision-making process and close the sale. Content marketing for this purpose is tricky though, considering the temptation to too heavily push your product. Still, these companies prove that it can be done. Among the most popular organizational tools online today, Trello expertly eases users from its free model to premium plans without the benefit of a true marketing plan. Rather, its site operates to onboard new customers and eventually prove itself so useful that they upgrade to paid users. A variety of purchase options underscores the company’s strong word of mouth. This company focuses on instant messaging and private chat services, building up its business to the point that it was ultimately acquired by a larger company. In addition to its innovative awareness methods, HipChat conveys the value and relative low price of its paid model to easily transition visitors into users, including a free model. Offering file storage and photo organization, Dropbox has expertly lured in users with its free services, and as such, its content marketing naturally leans into the premium paid model. The company’s fun approach to demonstrating its product’s usefulness is certainly a great example at the power of content marketing. Now that you have your audience in a state of rapt attention, it’s essential to keep that momentum going strong. Customer success ties into both the retention and monetization of your customer base, and the right content can help maximize your chances of achieving that. Let’s take a look at a few companies who have the right idea. Centering on the optimization of Facebook ads, this company goes the extra mile to foster its users’ understanding and appreciation of both its product and the industry in general. A broad library of blogs, guides, webinars and eBooks keeps users engaged and enthusiastic about the AdEspresso brand. This company aims to help customers with SEO and has developed an intuitive system to support its end goal. Ahrefs’ site features pop-ups that underscore the significance of building users’ knowledge of its product offerings and the many ways in which its services can provide value. Naturally, this company’s product focus on customer relationships translates well into its own business. Its sale funnel is punctuated with personal content designed to create a deeper connection with customers, and Zendesk’s dedication to its content is reflected in its site design. Although the inherent value in attracting customers upfront is undeniable, it’s perhaps even more difficult to keep them engaged in your brand. Once that happens, it’s far more straightforward to transition them into advocacy for your business. Here are some companies who pull it off nicely. Social media is such a driving force in today’s business, and HootSuite leverages its role to create a business of its own, employing some entertaining and engaging content marketing tools to keep users talking. A Game of Thrones tie-in video the company produced was particularly popular, impressing users and newcomers alike. Video marketing is, of course, essential to the way this company engages with users, seeing as its business centers on video hosting. Its site houses tutorial videos running the full gamut of how the medium is a useful marketing tool and keeping users engaged non-stop. No wonder Wistia has cultivated such a powerful community. This help desk application proves that you can utilize content marketing to build business regardless of your niche. Three distinct blogs focus on products, the customer experience and the personal stories behind the company, direct from its CEO. This transparency makes for irresistible content for and helps Groove appeal to a broad spectrum of users. While a number of companies have streamlined their SaaS efforts in specific stages of the SaaS Marketing Journey, some have figured out their strategy to such a degree that it runs equally strong throughout every stage. This company -- which offers customer relationship management systems -- has cultivated a devoted following amid multiple personas. From their website design’s focus on the buyer experience to its wide library of navigable content, its operation is deftly structured to maximize lead generation. When content marketing is the primary focus of your business, it stands to reason that you will have the tools well-integrated from top to bottom. Contently connects freelancers with content publishers and, in the process, designed a distinctive business model that licenses its resources out to publishers and advocates for ethical treatment of writers. This communications company hones in on job packages that drive its product, rather than the buyer personas of customers. Through a messaging guide and a deep understanding of its own niche, Intercom uses SEO and content marketing strategies to great effect while maintaining a close eye on analytics and consistent improvement. Its conversion rate continues to remain high enough to offset the blatant effort. Follow these best practices in your content marketing and you’ll cultivate a healthy following of prospects and clients in no time. For more SaaS solutions in marketing, and more tips on how to empower delighted customers, check out our eBook: Strategic Marketing Tactics for SaaS Companies.